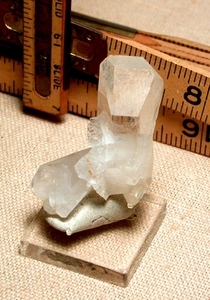 9-FACED chisel crystal with doubly-terminated 'handle' is a miniature sized rarity with amazing energy. A trinity of extra mini facets, and rare termination - great for reiki and other white light energy work! Three small sideways rider points and the milky-to-clear doubly-terminated crystal amplify. Extra dimension from light natural etching, growth craters, and whorls of palely white titanium to the clear chisel. Workably sized at 3/4x 1-1/4x 1-3/4" tall.